Ciclovía Salinas barricade volunteers must be age 18 or older. To be a barricade volunteer for upcoming date(s), contact http://bit.ly/CicloviaSalinas. whose service as barricade volunteers made the launch of Ciclovia Salinas possible. Go to http://bit.ly/CicloviaSalinas for Ciclovía Salinas contact information and other CS info and resources, including—in English y en español—posters and fliers; the Ciclovía Salinas etiquette; a summary about Ciclovía Salinas (who, what, when, where); how it happens (more volunteer opportunities, for youth too); and history, including photo galleries and links to the inaugural year acknowledgements plus all other Ciclovía Salinas posts on the Bicycling Monterey website. The info below, first published in 2013, gives you an idea of what barricade duty is all about. It also includes the names of those who served in this way at the inaugural event, October 6, 2013. 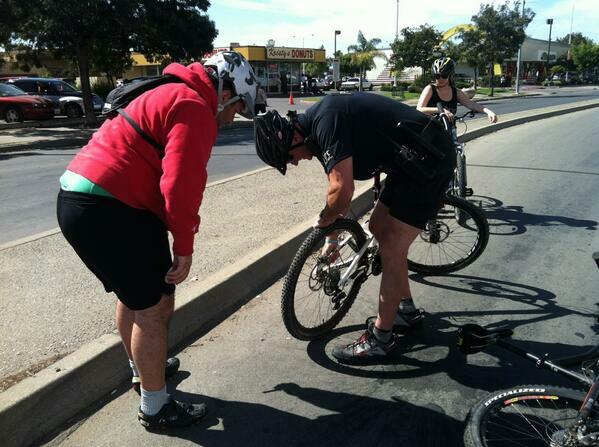 “Emiliano Peña, 30, was riding his brand-new bike at Ciclovia when the chain began getting stuck. Chief McMillin had been riding up and down the route all morning, and he stopped to help. And @MelendezSalinas provided hard evidence by sharing the photo below on Twitter (used by permission–thanks, Claudia). Thanks to the barricade volunteers and the many other individuals and organizations who made this inaugural Ciclovia Salinas so successful–not least of all, the attendees! Teamwork from City of Salinas officials and staff was vital. Besides Chief McMillin, there were other officials who caught the vision of this youth-led initiative and provided the necessary support so youth could turn their dream into reality. Read more about City of Salinas officials and how they helped. Thank you! Thanks to City leaders and the many other individuals and organizations who made the inaugural Ciclovia Salinas so successful–not least of all, the attendees! Ciclovia Salinas is grateful for its supporters. Please refer to Ciclovía Salinas Acknowledgements: Sponsors, Volunteers, Publicists, and More, and join us in saying thanks to these people for helping create Monterey County’s first Open Streets! There you’ll also find links to photo galleries from the inaugural date, October 6, 2013, along with how to stay in touch for 2014. Responsible adults are welcome to serve. Salinas Police Department is providing additional barricade volunteer training times before the volunteer shifts on October 6th. Barricade volunteers, by law, must be trained by police officers. Barricade volunteers: Please read final instructions, provided below, before arriving on October 6. To see who’s already volunteered, scroll to end of this post. Ciclovia Salinas is making Monterey County history–our county’s first Open Streets location, and among the first dozen in all of California! Join other barricade volunteers–essential to making this event possible! If you’ve already signed up for barricade duty and did not receive the Oct 4th and 5th emails from Andrea, please let her know immediately. Thank you. español: Ciclovía Salinas – Reglas de comportamiento y la Ley (v2). Ciclovía Salinas has received the unanimous approval of the Salinas City Council. “Sure, barricade duty is a serious responsibility. But that doesn’t mean we can’t have fun while doing it!” Second from left, Robb Garcia, and at center, Daniel Torres, are guys with a steady eye on community needs. These Knights of Columbus were joined by 21 other local citizens who came to the 9/12 barricade volunteer training in preparation for Ciclovia Salinas on 10/6. Why are more barricade volunteers needed? Alisal Street from Sanborn Road to Salinas Street will close to motor vehicles several hours that day for Ciclovía Salinas, Monterey County’s first Open Streets event! See a drawing of the route on the poster; click here. Sanborn and Salinas Street will be open to vehicles. A very few intersections along the route will also be open to vehicles, but these will have uniformed police officers directing traffic. All other intersections along the route will be barricaded and staffed by adult volunteers who have received training from police officers, which is required by law. That’s where you come in! Happily, the chief and officers from Salinas PD recognize Ciclovía Salinas can be of great benefit to Salinas and its visitors, so some of them offered to provide the trainings. Why help with barricades? Ask Gregg Brady! Prefer to help in a different way? Click here. Thanks to all who have expressed an interest in helping out with this amazing event, Ciclovía Salinas, either by your direct participation or by rounding up responsible adults who can help us with the many street closures needed to ensure a safe and successful event. Ciclovía Salinas will happen Sunday, October 6 from 10 a.m. to 2 p.m. Volunteers will be needed to staff barricades and ensure no civilian traffic enters the event, and if the need arises, to take the barricades down as necessary to allow access for emergency vehicles. The more volunteers we have, the less time each of us will have to spend on the barricades. More volunteers mean we can relieve each other and even participate in the event activities ourselves. The law requires that volunteers on traffic post receive training from the Police Department. take their jobs seriously. And these Constables of the Peace in the Monterey County seat take bicycling and other people-powered forms of transportation seriously too! That’s one of the many reasons they support Ciclovía Salinas, the first Open Streets event in Monterey County. Learn more about Ciclovía Salinas, and how to support it. Who’s already volunteered to help with barricades for Monterey County’s first Open Streets, Ciclovia Salinas? Below is a partial list. To volunteer, contact Andrea (see top of post). To have your name added to this published list (to help inspire additional volunteers! ), please contact Mari. 24. Francis C. “Frank” Jones, Jr.
Scroll down for general information about Ciclovia Salinas. This post was first published on 7 September 2013, with some subsequent updates. Posted by: Founder, Bicycling Monterey on 27 July 2017. One or more updates last made on 2 August 2018.